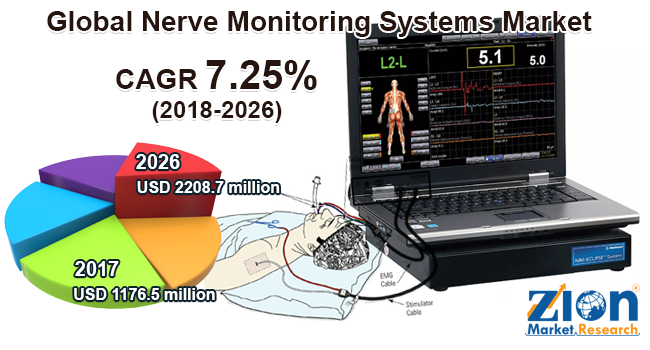 Global nerve monitoring systems market expected to generate revenue of around USD 2208.7 million by end of 2026, growing at a CAGR of around 7.25% between 2018 and 2026. Nerve monitoring systems are used to supervise nervous system during intraoperative surgeries. The report covers forecast and analysis for the nerve monitoring systems market on a global and regional level. The study provides historical data from 2015 to 2017 along with a forecast from 2018 to 2024 based on revenue (USD Million). The study includes drivers and restraints for the nerve monitoring systems market along with the impact they have on the demand over the forecast period. Additionally, the report includes the study of opportunities available in the nerve monitoring systems market on a global level. In order to give the users of this report a comprehensive view of the nerve monitoring systems market, we have included competitive landscape and analysis of Porter’s Five Forces model for the market. The study encompasses a market attractiveness analysis, wherein product, technology, application, end-users segments are benchmarked based on their market size, growth rate, and general attractiveness. The study provides a decisive view of the nerve monitoring systems market by segmenting the market based on product, technology, application, end-users, and regions. All the segments have been analyzed based on present and the future trends and the market is estimated from 2018 to 2026. The global nerve monitoring system market is classified by product, technology, application, end-users, and by region. Based on the product, the nerve monitoring systems market is categorized into nerve monitors, nerve stimulation electrodes and probes, and accessories. Based on technology, the market for nerve monitoring systems is segmented into electroencephalography (EEG), electrocorticography (ECOG), electromyography (EMG), & evoked potential (EP). On the basis of applications, the nerve monitoring systems market is classified into spine surgery, neurosurgery, cardiovascular applications, ENT surgery, and others. Based on end-user, the market is classified as ambulatory surgical centers & hospitals and surgical centers. The regional segmentation includes the current and forecast demand for North America, Europe, Asia Pacific, Latin America, and the Middle East & Africa with its further categorization into major countries. This segmentation includes demand for nerve monitoring systems market based on individual product, technology, and end-user in all the regions and countries. Some of the key players in nerve monitoring devices market include as NuVasive, Medtronic Plc, Nihon Kohden, Dr. Langer Medical, Neurovision Medical, Checkpoint Surgical, Nihon Kohden, EMS Handels, Halyard Health, Inomed, Erbe Elektromedizin, and others.